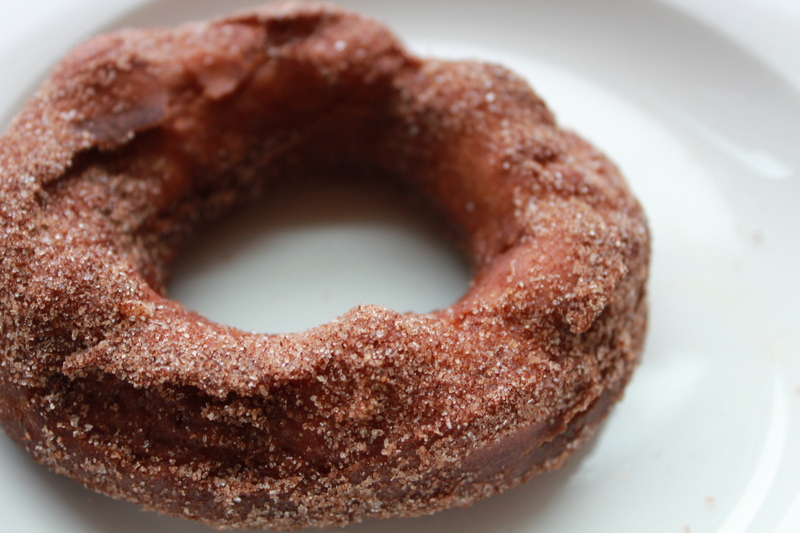 Homemade cake doughnuts are to die for: the crisp outsides and slightly sweet, cakey, moist insides. They’re so delicious. They’re much more substantial than yeast doughnuts, which are far sweeter and sort of fall apart when you bite into them. 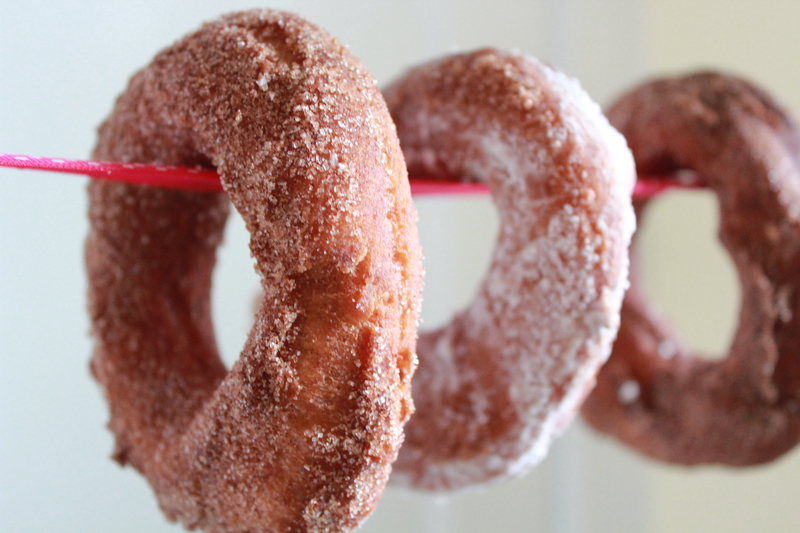 Cake doughnuts retain a crispy outer shell from frying and are perfect with a touch of cinnamon sugar or powdered sugar coated on their flaky crusts. At my house, we make these delectable delights twice a year. Our church has an international general conference for all members every October and April, which we watch as a family on T.V. 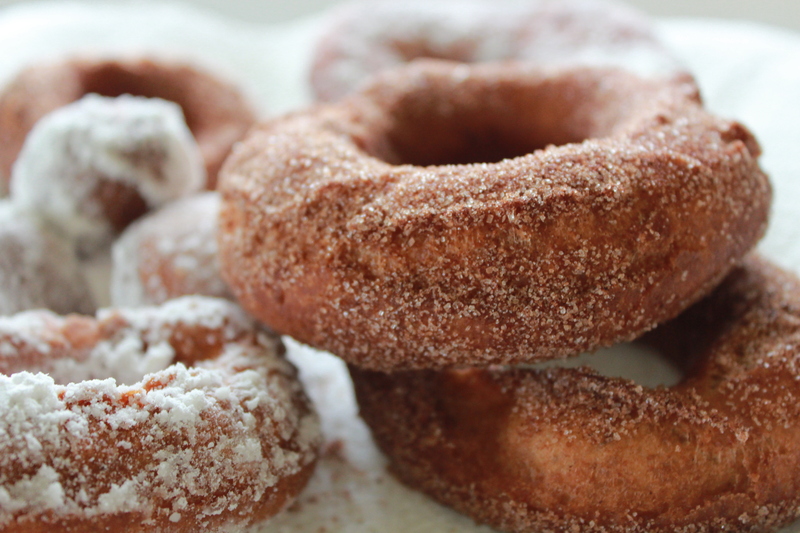 It’s the only Sunday of the year where we vedge out in front of the television, and doughnuts are a perfect compliment. It’s a fun family tradition, too: I make the dough the night before. In the late morning, my daughter and I roll out the dough, getting coated in flour in the process, while Ryan mans the stove. Each time he slides a doughnut into the hot oil, it sizzles and pops. Soon our kitchen is filled with the amazing fragrance of frying sweet dough. I can’t take credit for the recipe, which is from a Better Homes and Gardens Cookbook. This is just about the only recipe I make out of that book, and I’ve altered it to be half whole wheat, but it’s a family favorite. I like the nutty taste the whole wheat lends the doughnuts, but, more importantly, it’s the way my mom always made them, so I feel like it’s the way they’re “supposed” to taste. A word of warning: make only as many as you plan to eat that day—I usually make a half recipe and we often give a few to the neighbors. These are really only good when piping hot; I wouldn’t even bother eating them once they sit around for a few hours. They just lose that fabulous crispiness. The recipe says it makes 15, but I must use a smaller cutter, because it seems I always end up with many more than that. I think these are definitely best when fried until dark brown (which is probably worse for you); others in my family like them light-brown. There’s no wrong way to do it. I would love, love, love to get a doughnut pan, so I could bake doughnuts, which would presumably be less messy and healthier. I think I’d still do this real deal for our twice-a-year tradition, but I’d like to experiment with one of these pans at other times. Does anyone have one? Do you like it? Are the doughnuts as tasty as their fried counterparts? Or are they like round muffins with holes? Special Diets & Allergies: Nut free, soy free (if you use the right type of oil), dairy free (if you use non-dairy milk), vegetarian. 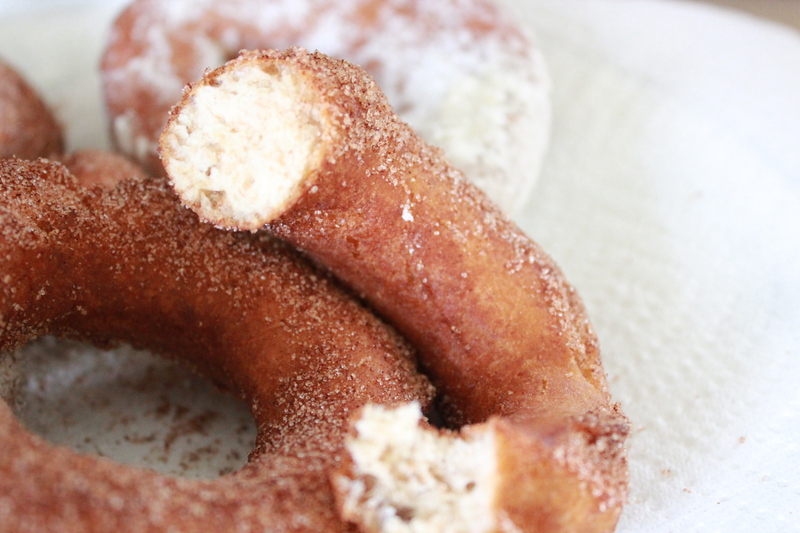 These delicious doughnuts are crispy and golden on the outside with moist centers. Plan on eating them as soon as you make them (or while you fry the next batch): they’re far superior when hot. 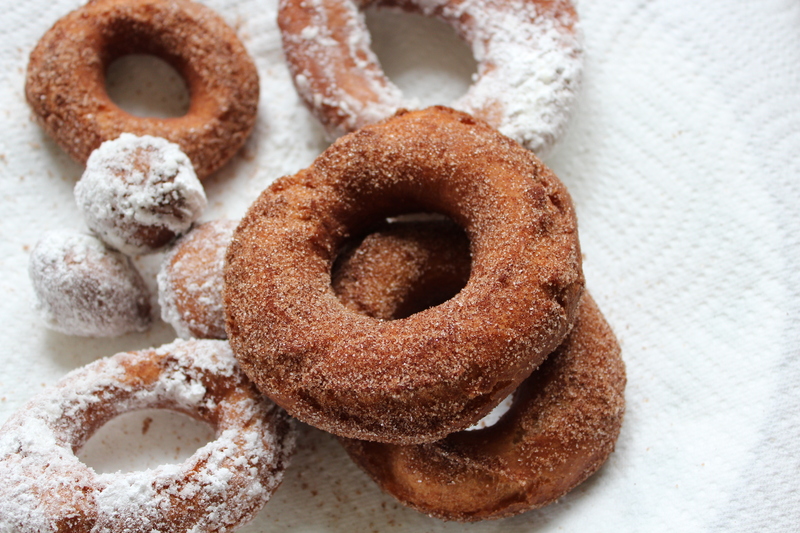 Put the powdered sugar and cinnamon and sugar in separate cereal bowls, which are large enough to dunk a doughnut in, but not so large that the sugar is too shallow to coat the doughnuts. Pour the oil in a heavy-bottomed, large soup pot. Mix the flours together. Combine 2 C of the flour mixture, baking powder, cinnamon, nutmeg, and the salt. In a medium bowl, combine the milk and melted butter. In a large mixing bowl, combine the eggs, sugar, and vanilla. Beat with an electric mixer about 3 minutes or until thick. Alternately add flour mixture and milk mixture to egg mixture, beating after each addition just until combined. Stir in remaining 1 C flour. Cover dough and chill for 2 hours or more. Turn the dough out onto a lightly floured surface. Roll dough until 1/2″ thick. 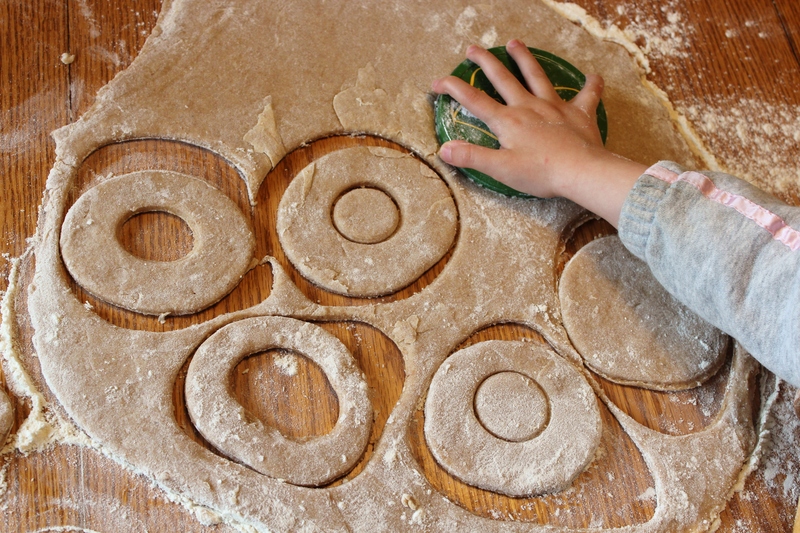 Cut dough with a floured 2 1/2″ doughnut cutter, dipping cutter into flour between cuts. Using a smaller cutter, cut out doughnut holes in the center of each doughnut. Reroll as necessary. Fry doughnuts, 2 or 3 at a time, in deep, hot oil (375 F) about 1 minute on each side or until golden, turning once with a slotted spoon. 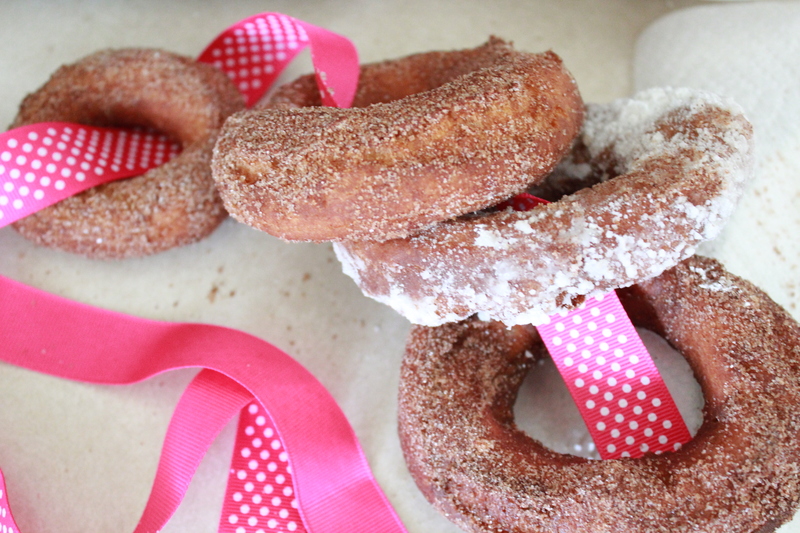 Drain on paper towels for just a second before popping into the bowls of powdered sugar or cinnamon and sugar. Place back on paper towels and allow to cool until just past piping hot. Eat immediately. Man, those look good! I just bought a donut making machine thingy and can’t wait to create something in the kitchen!